More people die of heart attack and stroke, than from any other cause. South Asians have a higher risk of heart attack death at a young age. They often have artery inflammation, and even heart disease, under age 301. If you know that you have this disease earlier, you can reduce your risk greatly! Since 2010, we have been helping patients detect their level of artery disease, called atherosclerosis, and make treatment decisions to maximize their reduction of heart attack and stroke risk. We use IMT & plaque ultrasound to both detect the presence of artery disease and to confirm the success of heart attack and stroke risk reduction treatments, not for predicting the chance of a heart attack or stroke at some time in the future. Patients make more effective treatment decisions based on knowing whether they have artery disease, how bad it is, and whether their efforts to reduce risk are working. The cause of heart attack and stroke is bad cholesterol that becomes trapped in the wall of the artery. It becomes so inflamed by the body’s clean-up process, that toxic side effects of inflammation kill the smooth cells that line the artery, causing a rough spot. Blood cells stick to the rough spot causing a clot, that fills the artery within seconds. Both the cholesterol and inflammation that make up artery disease, thicken a layer in the artery wall called the intima-media. Uncontrolled inflammation continues to thicken the IMT, but controlled inflammation does not, and is much less likely to kill the smooth lining cells. Plaque, is a localized mound of artery wall cholesterol inflammation, that is at least 1.3 mm thick, which further greatly increases the risk of heart attack or stroke, beyond the background IMT. FIGURE 1: IMT/Plaque Ultrasound images showing intima-media layer of arterial wall (left image) and carotid artery plaque build-up (right image). It follows that one of the first structural changes that can be detected non-invasively in artery disease is an increase in IMT, which can be very accurately measured using harmless sound waves, by a special high frequency ultrasound, called an IMT/Plaque ultrasound. This is an FDA approved test that measures the thickness of the two innermost layers (intima and media) of the walls of the carotid artery (located in the neck). Our ultrasound provider’s proven reproducibility also allows for year over year comparisons enabling treatment decisions based on IMT changes10. Having the average progression of thickening of the IMT creates a one in three chance of dying from heart attack or stroke, lifetime (between 29 and 38%3). A normal IMT (less than 0.6 mm thick), results in a 1 in 800 chance of having a heart attack, over 10 years3. IMT/Plaque Ultrasound is one of the only tests to find artery disease at a stage in which it can be stopped before plaque (high risk thickening) occurs, and when the disease is much more likely to be reversible. An abnormal IMT/plaque ultrasound preceded 98.6% of heart attacks in one study of 10,000 patients over 10 years3, compared to 29% preceded by high bad cholesterol in a study of 137,000 patients4. This is because it is a measure of how much artery wall disease you have at the present time and shows you how bad it is, whereas your cholesterol level is a risk factor, that can only be used to calculate a statistical chance that you may get a heart attack in the future. While we use the IMT/plaque ultrasound for disease detection, and not for heart attack risk prediction, another study did find that a very high IMT/plaque ultrasound score indicated seven times more risk than is predicted by all other risk factors combined (cholesterol, blood pressure, diabetes, smoking weight, exercise and alcohol) for women, and twice the risk for men5. In addition to the detection of atherosclerosis, the IMT/Plaque ultrasound has proven invaluable in treatment assessment. Studies have found that patients’ artery disease can progress, even after their cholesterol level is controlled by medication, doubling the chance of heart attack and stroke. By adding treatment, regardless of cholesterol levels, until the ultrasound showed that the disease had stopped thickening the artery wall plaque, the rate of heart attack, stroke or death was reduced by two thirds5. (See Figure 2). In addition, 50% of patients’ artery wall disease decreased (became less thick) by this approach of treating the artery instead of just treating risk factors, such as cholesterol levels and blood pressure, compared to a 25% regression rate when only treating until those risk factors reached treatment guidelines. 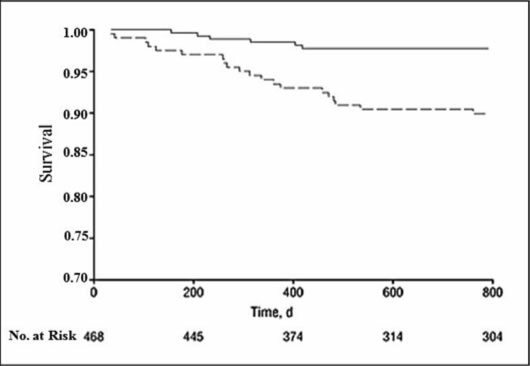 FIGURE 2: Survival free of heart attack, stroke or death, in high risk patients with asymptomatic carotid stenosis, was higher (upper line) with medical therapy to reduce plaque progression, than with medical therapy to reduce cholesterol blood tests and blood pressure to guidelines (lower line)6.
Who should have the IMT/Plaque Ultrasound? The above risk factors as well as aging are contributing factors to an increased carotid intima-media thickness as well as risk for heart attack and stroke. At Cogent Family Healthcare, if, following an IMT ultrasound, artery disease is found, your condition is further assessed using blood tests that measure factors that contribute to artery wall inflammation. Each factor responds more favorably to different treatment interventions, so the blood test enables us to determine the optimal treatment plan for you. Our treatment of abnormal inflammatory components frequently results in resolution to normal in 6 to 12 weeks. Inflammation Analysis: Inflammation analysis covers a variety of inflammatory markers, the most notable being myeloperoxidase (MPO), an enzyme that has been found to be to play a role in the inflammation in the artery wall. Multiple studies show that the plaque in the artery walls contains large amounts of MPO. This is especially true in places that are prone to rupture and can lead to heart attacks. Higher inflammation means that you are at a higher risk of having a heart attack. Studies show that, among patients with chest pain, an increased MPO level can predict their risk of heart attack over the next 30 days to six months. In other, longer studies involving middle-aged patients who were assumed to be healthy, an elevated MPO level predicted the risk of heart attack over two to 10 years. Cardio Metabolic Analysis: A cardio metabolic analysis covers the three main areas of keeping a healthy metabolic profile: Glycemic Control, Lipid Profile, and Vascular Inflammation. While cholesterol testing has historically been used as the standard indicator for cardiovascular disease, up to 71% of people who have suffered heart attacks had “normal” cholesterol levels. This discrepancy is because it is the lipoprotein particles that carry the cholesterol particles throughout the body, not necessarily the cholesterol within them, that are responsible for key steps in plaque production and the resulting development of cardiovascular disease. At Cogent Family Healthcare, we provide advanced cholesterol testing technology that accurately measures both the density and number of lipoprotein particles. More than 30 percent of the population has a condition in which a patient’s cholesterol may be “normal” but their lipoprotein particle number, and hence, their actual risk, could be much higher than expected. Measuring the lipoprotein subgroups and other inflammatory factors, is the only way to evaluate such risk factors, which is crucial for an accurate assessment of cardiovascular risk, and the establishment of an effective treatment program. Furthermore, it allows us to monitor your progress as we aggressively treat your cardiovascular disease. We can document improvements or progression and make appropriate adjustments to help you reduce your risk of a heart attack or stroke. How Does IMT/Plaque Ultrasound Compare to Other Tests? Risk factor calculator ACC/AHA. Artery wall plaque, which we measure as part of the IMT/plaque test, was found to be more than 3.4 times as powerful as the Framingham Risk Score in identifying heart attack risk7, and in another study, a very high IMT/plaque ultrasound score indicated seven times more risk than is predicted by all other risk factors combined (cholesterol, blood pressure, diabetes, smoking weight, exercise and alcohol) for women, and twice the risk for men5. The cardiac calcium score detects artery disease at a later stage than IMT, because inflammation and plaque are not calcified for many years, and frequently cause heart attack before calcification occurs. One study found that 47% of patients with a normal cardiac calcium score of zero, had plaque found on the IMT/Plaque Ultrasound8. An editorial in Mayo Clinic Proceedings9 stated “CIMT measurements might indeed be best used in younger patients in an office-based outpatient care environment (as opposed to the cardiac calcium score, which has a low prevalence in younger patients) with easily portable devices and without exposure to ionizing radiation.” The FDA and NIH also accept IMT/Plaque Ultrasound (but not coronary calcium scanning) to follow patients for atherosclerotic disease progression. The IMT/plaque ultrasound also does not expose the patient to ionizing radiation, as the cardiac calcium score does. A treadmill stress test only detects narrow points in an artery, which form after many years of severe artery inflammation. Similarly, chest pain during exercise only occurs when such narrow points are present in an artery, a much later stage of artery disease. No preparation is required for the IMT test. Patients may resume normal activities immediately following the test unless otherwise instructed. A diagnostic medical sonographer will perform the test in our office. A thick gel, the same consistency as hairstyling gel, is applied to the skin of the neck. With the use of a transducer (a small microphone-like device), the gel helps the sound waves to get from the machine into the body. 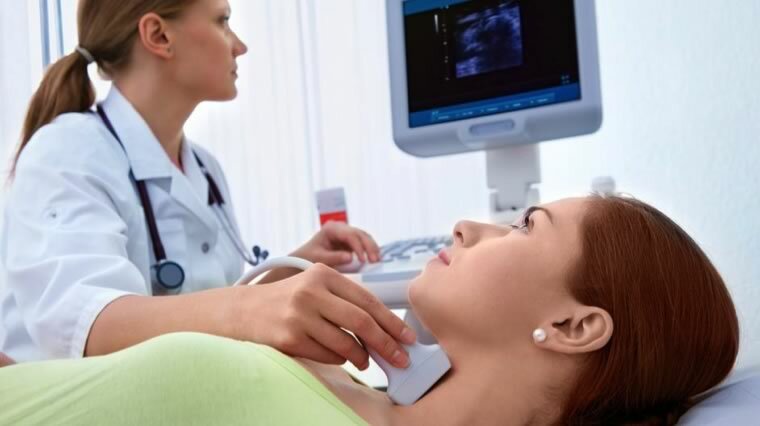 Sound waves bounce off the carotid arteries. This creates "echoes" that are reflected back to the transducer, which converts them to electronic signals. A computer then processes the signals into pictures and shows them on a computer monitor. Health, United States, 2016. http://www.cdc.gov/nchs/hus.htm. Mortality rate from heart disease and stroke corresponding to dates studies were done that created the composite curve for lifetime IMT progression used on Cardiorisk patient reports (See references on these reports). Gianni Belcaro, et al. Carotid and femoral ultrasound morphology screening and cardiovascular events in low risk subjects: a 10-year follow-up study (the CAFES-CAVE study). Atherosclerosis 156 (2001) 379–387. Amit Sachdeva, MD, et al. Lipid levels in patients hospitalized with coronary artery disease: An analysis of 136,905 hospitalizations in Get With The Guidelines. Am Heart J 2009;157:111-7.e2. Association of coronary heart disease incidence with carotid arterial wall thickness and major risk factors: The Atherosclerosis Risk in Communities (ARIC) Study, 1987-1993. Chambless LE, et al. Am J Epidemiol.1997 Sept 15;146(6):483-94. J. David Spence, MD et al. Effects of Intensive Medical Therapy on Microemboli and Cardiovascular Risk in Asymptomatic Carotid Stenosis. Arch Neurol. 2010;67(2):180-186. J. David Spence, MD et al. Carotid Plaque Area: A Tool for Targeting and Evaluating Vascular Preventive Therapy. Stroke 2002, 33:2916-2922. Steven J. Lester MD, FRCPCa, et al. Carotid Intima-Media Thickness and Coronary Artery Calcium Score as Indications of Subclinical Atherosclerosis. Mayo Clinic Proceedings. Volume 84, Issue 3, March 2009, Pages 229-233. Thomas Gerber MD PhD, Allen Taylor MD. Editorial: Carotid Intima-Media Thickness: Can It Close the “Detection Gap” for Cardiovascular Risk? Mayo Clinic Proceedings. Volume 84, Issue 3, March 2009, Pages 229-233. Naomi O. Riches, Stephen Alder, George L. White, Regina Druding, M. Gene Bond and Mario De Michele. Standardized ultrasound protocol, trained sonographers and digital system for carotid atherosclerosis screening. Journal of Cardiovascular Medicine 2010, 11:000–000. Jeemon P, Prabhakaran D, Huffman MD, et al. Distribution of 10-year and lifetime predicted risk for cardiovascular disease in the Indian Sentinel Surveillance Study population (cross-sectional survey results). BMJ Open. Jan 1 2011;1(1):e000068. Actual intima-media layer and soft plaque image. Effects of Intensive Medical Therapy on Microemboli and Cardiovascular Risk in Asymptomatic Carotid Stenosis. J. David Spence, MD et al. Arch Neurol. 2010;67(2):180-186. If you’re at risk for cardiovascular disease, contact Dr. Sims today to schedule your artery wall evaluation. This quick, painless, FDA-approved test could save your life! Call Cogent Family Healthcare in Mountain View, California at (650) 386-0386.